OUR PRICE: $54.40 - Join Rewards Get $5 Dance Dollars On This Item! Bloch's "Boost" canvas dance sneaker features an adjustable last for better fit, a spin spot design for better turns and increased aircushion pressure. This lightweight, canvas dance sneaker also has a variable lacing system and molded EVA sock liner with contour heel and elevated arch. These sneakers are awesome!!! i am ordering a new pair after 3 years because I left them outside for three days and the sun took a toll on them, but other than that I am very happy to have purchased them, many of my fellow dancers say they cant dance in sneakers but I have found out its because they do not support the arch, and these do... very true to sizing mesurments I am an 8 M and I ordered a 9 according to the scale, they fit with thin socks or without them. I can do three or four turns and kicks are very secure. follow the suggested fitting fun fun fun fun fun fun! We bought these sneakers for my daughter's hip-hop class. Sneaker is comfortable and easy to move in. When other people say it runs small...it REALLY runs small. My daughter was in a child size 2 so I ordered 2 sizes bigger as the instructions state which was an adult 4. When we got them, she couldn't put her foot in them. I returned for a refund and ordered an adult 6 instead. PERFECT!!! These are quite comfortable and durable, the spin spot and split sole are great, they really help your feet move as naturally as possible. They also breathe really well and have excellent support, and are quite light. The one downside is they are sized very small. I am a street size 11 and bought a 12; I could still use an extra half size (if not a full size) more room to keep my toes from being squished. I definitely recommend going up 1.5 sizes if you have wider feet. My daughter uses these shoes for her hip hop classes and I have used them for Zumba. They do run very small. She is a size 3.5 to 4 street shoe and fits nicely into a 6.5. She likes the spin spot and the split sole. This is my 2nd pair of Boosts. The first pair lasted over 5 years with hard wear. Love the cushioning and spin spot. The fit is great once you figure out you NEED TO ORDER 1 1/2 SIZES UP. Just wish the other colors were not more expensive. Why so? Anyway, great shoe for zumba. I purchased these shoes for leading Zumba classes, and I am absolutely sold on them! I ordered a half-size larger than my street -shoe size and they fit perfectly (and look great with Zumba wear). Plenty of toe room, great cushioning inside the shoe, easy to lace up, a comfortable, flexible arch and very light - weight! When these shoes crash, I will definitely buy another pair! My teacher discount and flat rate shipping made them a great deal, too. can't get the size right! Tried to follow recommendations for sizing. Usually wear a size 7 street shoe. Purchased size 8.5 and they were too big. Reordered size 8 and they are too small! Need larger toe box and narrow heel, so I am admittedly hard to fit. Customer service has been great! Will try different brand. I have had this dance sneaker for about 4 years and it is still in great shape! I usually dance in heels, but I use this sneaker for warm-up and teaching. I don't have high arches, but the arch support feels good for me. I also like that the shoe has a little bit of height and a sturdy toe block. I am a size 6.5-7 in street shoes and I have a size 8. The only con I would say is that these shoes aren't the slimmest or lightest for carrying around. If you have an already full bag, these will fill it up even more. Other than that, these shoes are a great buy! I am about to order my third pair. I have found these to be the only shoes I can walk around in... They fit the heel perfectly and give great support between the front and back of the foot. Nice and flexible in the middle for some articulation, but not a magnificent point, at least for my foot, but the best feeling shoe I have ever worn. Must order larger as the guide says. These look great with work clothes even, like a suit, and can have an oxford look. They have some height to them which I like. I have these shoes and they are awesome! I like that they have a split sole unlike any normal sneaker you would find at a shoe store. They do seem to come untied alot though. I would recommend these to any one who takes hip hop or is looking for a comfortable shoe! I recently bought these shoes for Zumba and got to wear them for the first time today. I really like them! they were a perfect fit, I just followed the sizing chart. and I was able to spin and pivot so easy in Zumba tonight. I think this is one of the best purchases I made this year. I wear a 10 3A - long and really narrow. I bought this shoe in size 11 about 2 years ago and wore it out contra dancing. It was always just a tad too short. I just bought another pair, size 11.5 and it is absolutely perfect. The lacings on this shoe allow me to really cinch it up snug on my foot/arch and it conforms beautifully to my stick-like feet without leaving big gaps in the toe box. 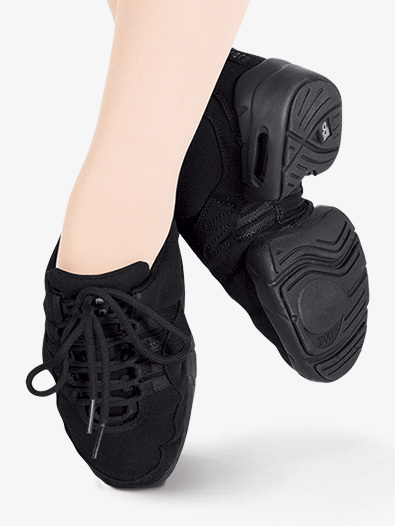 I've tried Leo and Capezio, and this shoe is by far the best for me. Thank you, Bloch! Sizing: Now that I rarely wear heels, my "medium" width feet have spread out a bit. Going up 1.5 sizes from my typical street shoe was definitely necessary. I was afraid that the extra length might trip me up, but not at all. Arch support: after all of the remarks touting good arch support I was looking forward to a good fit for my somewhat-high arches. Instead, the arch area lost support, starting with part of my heel. To compensate, I've inserted Dr. Scholl's Tri-Comfort insoles and loosened the laces. That seems to work well. I have yet to use these new shoes in my Zumba class, and will offer an update if there are any "surprises" that might be useful to you. I've had these shoes for almost a year now and I can't even tell, they look like new (I only go to a once weekly dance class). I'm normally somewhere between 8.5-9.5 street shoe size (it depends on the shoe). I got a ten and they fit great. At first they were a bit snug but now they fit like a glove. Because of the split sole they don't hurt my feet like normal sneakers. I even wear them to the gym! I once wore them for a 3 hour dance class and my feet only slightly hurt (I usually go barefoot so my feet don't like being restricted). The only thing I don't like about them is the super thick sole. It makes it harder for me to stretch on the ground because my foot is elevated about an inch (in splits, etc.). I have had these shoes for about 6 months and they still look new. I use them to teach Zumba and practice Zumba for 4+ hours at a time and have not had any arch, heel or ball problems. I just did a Zumba convention in Nov which was dancing for 3 days straight. After the first day of the convention I was worried that my feet would be too sore to walk in them the next day but my feet were fine for all 3 days. For Zumba they are awesome shoes and I recommend them to my members because they are great for pivoting moves and the ability to glide across the floor. I got these shoes because I thought that they won't make me look girlish and It worked! I'm a part time company dancer for Jazz. These really gave me more flexibility than the real Jazz shoe! I was so excited to get these shoes - I was expecting them to be really comfortable, etc. After dancing for an hour in these, I had to ask my teacher if I could change shoes because these killed my arches! My heel and ball of my foot felt like they were bruised after wearing these. I just received my Bloch's "Boost" dance sneakers, and I LOVE them! Great support, and very flexible for easy pointing! I got these for my birthday and I absolutely love them! It was a little complicated though, because they ran small. But once I got my size, they are great! For people that do both jazz and hip-hop, these shoes are wonderful for both, but you might wanna get 2 sizes bigger. These Jazz sneakers look very stylish. They are also great to dance in! Are the sizes for these shoes Mens' sizes? These are unisex dance sneakers. Please see the sizing chart for suggested fitting. Has anyone else experienced any problems with the soles of the Bloch"Boost" dance sneaker? This has always been my favorite shoe for Zumba, but the last two pairs I've bought started leaving black marks almost like tiny black pieces of the sole on the dance floor after just a few months of wear. I can't wear them on the studio floor anymore because the black marks are so difficult to remove. I really hope to be able to continue using these shoes, but I'wondering if the composition of the sole has changedthat's what is causing them to disintegrate quickly. We are not aware of any composition changes to the item. I last bought a pair of these shoes in the 1990s (and they've finally worn out!). The size label in my old shoes says 8, but 8 (possibly 7-1/2) is also my street shoe size, and I see that customers are being advised to go 1 - 1-1/2 sizes larger than street shoe size. Has the sizing changed? Should I trust the size label in my current shoes, or the advice on this page? I would trust the sizing recommendation which is listed online. The sizing guide recommends ordering 1 to 1.5 sizes larger than your street shoe size. I wear women's 8.5 or 9. What size should I order in these? The manufacturer suggest women to order up 1 to 1.5 sizes from street size. Though we cannot guarantee sizing, I would most likely suggest trying a size 10. Do you have these shoes with a greater width? I tried the Adult "Boost" Dance Sneaker black shoes in a size 12 and 13, and they were still very uncomfortable because the shoes weren't wide enough for my feet. I was wondering if you have these type of shoes in greater width or would a larger size in the shoes would be able to increase the width of the shoes? I thank you for your time and I hope you have a blessed day. Bloch sneakers sizes do run on the narrow side. I would suggest trying the Capezio brand, this should be a wider width.